Samsung Galaxy Tab 620 is the next generation sleekest tablet in series of tablet devices launched by Samsung under Galaxy family. This 7 inch tablet has many unique features that differentiate it from the other tablet in fashion in the device market. 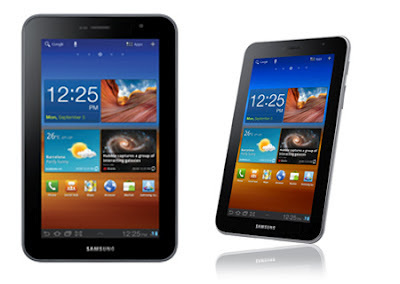 The Samsung Galaxy Tab 620 has a 7-inch compact display. The device has weight just over 345 grams and is provided with the better battery backup. Build of quality glossy music, the tablet appears quite clean and stylish. With rounded edge, the device is covered with an aluminum plate on the backside. The tablet has a MicroSD card slot and a SIM card slot that are positioned at the left side of the device. The power button and the speaker are situated at right side on the device. It is equipped with a 1.2 GHz Exynos processor that allows a user to load and play games comfortably. The processer has also improved the speed of the internet and apps can be operated much easily on the device. The tablet has a 7-inch PLS (plane-to-line switching) panel. It is available in 1024x600 picture resolution. The Samsung Galaxy Tab 620 is powered with 1 GB RAM and internal memory storage of 16 GB, which can be upgraded to 48GB with the help of a 32GB microSD card. One also can watch full HD videos in 1080p. The tablet too supports famous video formats like AVI, MP4 & MKV. OS Honeycomb installed in the tablet adds strength in performing routine tasks on the like emailing, browsing, reading news, multimedia and more. The tablet is provided with a 4000 mAh battery which survives over 12 hours of working with moderate to the heavy use of the device. No doubt, it is the best seven inch tablet that comes into price range of Rs 25,900 on a very good price and bargain.